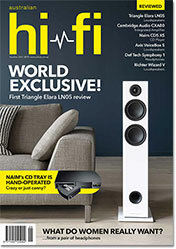 Yamaha's new Sonos-killer products, Sopranino add-on Supertweeter, changes for Music Hall and Dynaudio, arty grilles for VAF, a total revamp for B&W, discounts on Harbeth M40.1, game-changing DAC from Chord, DSD from Sony, Gold Note's Atomic clock for CD, dCS future-proofs its Rossini... and more. What do women really want? No-one really knows... but headphone designers are having a go. Rod Easdown reckons they've missed the mark. Dieter Burmester, founder and CEO of famous German high-end audio manufacturer Burmester Audiosysteme GmbH. Tired of traipsing down to the newsagent to secure your copy of Australia's best and greatest hi-fi publication? If you subscribe, we can deliver the real thing to your door, or an electronic facsimile to your device. An exclusive! 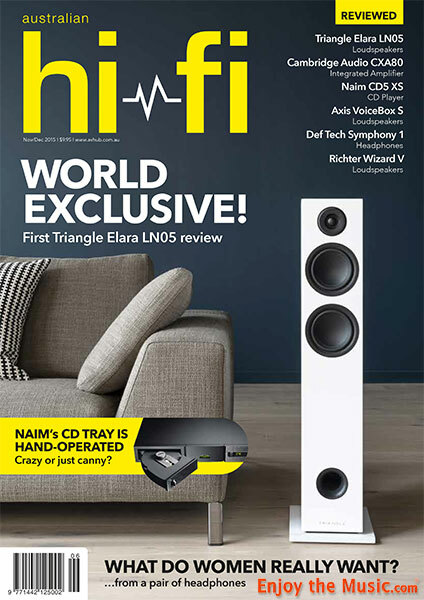 The world's first review of the new Elara LN05. Not only a clean, crisp look, but also clean, crisp and totally musically satisfyingly sound! A fantastic new anti-clipping circuit, superb build quality, sophisticated industrial design, high power and super-low distortion. But how does it sound? Is it ominous that reviewer Lesley Swan's conclusion contains both a recommendation and a warning? 'We have a new small monitor reference in our hot little hands!' says reviewer Edgar Kramer of the latest creation from designers John Reilly and Brad Serhan. Near-perfect sonic presentation and supplied fully loaded with all the options�wired, wireless, USB, and active noise-cancellation. Great new albums from Public Image, The Waifs, The Strypes, and Squeeze, but Boy & Bear and David Gilmour get their card marked 'Could Do Better'. Lenny Breau spent over 20 years of his short life figuring out how to play stuff on his custom 7-string guitar that were supposed to be technically impossible. Now you can hear the result. Classical pianist Christian Jacob has released his first jazz album and Sonja Fraki has released an album of works for solo piano written by Finnish composer Kalevi Aho. Experience The Who live at Shea Stadium from back in 1982, and Eric Clapton's farewell tour (Planes, Trains and Eric) from 2014. In both cases the magic of Blu-ray means great sound... mostly. When was the last time you saw a badge on a product that said 'Proudly Made in China'? No, we thought not... so get ready for a first-time experience.